On the back of an exciting 2018, some 526,215 registered food outlets resulted in 105 premises achieving our revered Good Food Award for 2018. 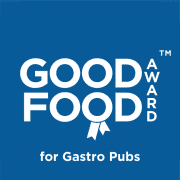 Our Good Food Award for Gastro Pubs has until now been a sub-category within our Good Food Awards. We are pleased to announce today that we are to make some exciting changes over the coming months, the first of many is a welcomed change to the award periods for our coveted Good Food Award for Gastro Pubs. Following on from feedback from our award holders and their customers we have been looking at ways in order to maximise the validity of our Awards Programme, and in turn, the exposure our Award Winners achieve. Our 2019 Awards programmes have been brought forward in order to facilitate these changes, resulting in future awards being announced on 01 November each year in readiness for the approaching year. We believe these changes will be beneficial to our awards programme as a whole, the increased coverage of our awards in 2018/19 will attract new followers to our awards programme and increase exposure and validity to the holders of our Good Food Award for Gastro Pubs. Secondly, as The Good Food Award for Gastro Pubs will now be an award in its own right this provides us with the opportunity to provide renewed focus within the industry, raise the entry requirements yet recognise more Gastro Pubs.